Callinex Announces Zinc and Gold Discovery With 10.3m Grading 13.1% Zn Eq. Including 4.2m of 20.8% Zn Eq. - Callinex Mines Inc. 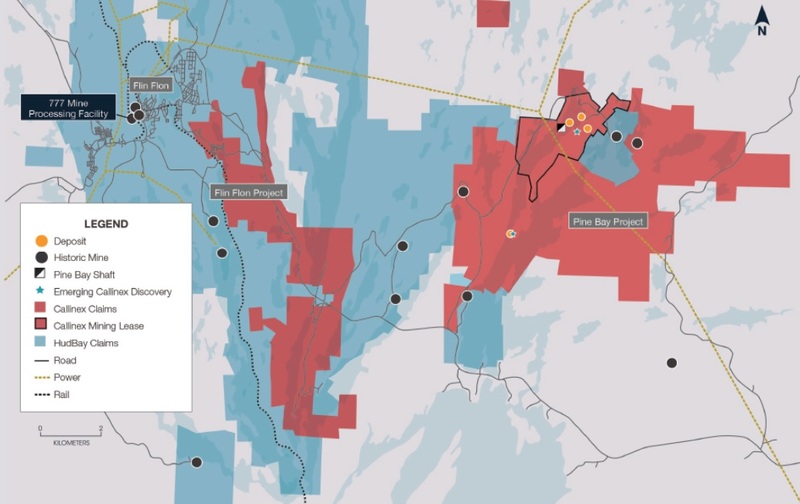 The discovery is situated within a mining lease located 16 km from HudBay’s processing facilities, which have less than four years of ore remaining. Vancouver, British Columbia – October 18, 2016 – Callinex Mines Inc. (the “Company” or “Callinex”) (TSX-V: CNX; OTCQX: CLLXF) is pleased to announce a new high-grade zinc, gold, silver and copper discovery at the Company’s Pine Bay Project, located near HudBay’s operations in Flin Flon, Manitoba (See Figures 1, 2 and 3). The discovery hole, 284-3-93-DPN, intersected 10.3m grading 13.1% zinc equivalent mineralization (“Zn Eq.”) containing 6.0% Zn, 1.8 g/t Au, 60.4 g/t Ag, 0.7% Cu and 0.4% Pb including a higher grade interval over 4.2m grading 20.8% Zn Eq. containing 11.8% Zn, 2.4 g/t Au, 73.8 g/t Ag, 0.7% Cu and 0.7% Pb. The discovery was made by extending a historic Placer Dome drill hole by 38 meters. The historic drill hole, which ended in copper-bearing sulphide mineralization, was initially drilled as part of their mandate to discover a 30 million ton Volcanogenic Massive Sulphide (“VMS”) deposit at the Pine Bay Project. Many of the largest deposits within the Flin Flon Greenstone Belt have been discovered at depth, such as the 777 Mine that was the discovered at a down-hole depth of 1,278m and the Lalor Mine that was discovered at a down-hole depth of 781m. HudBay’s nearby 777 Mine has proven and probable reserves totaling 6.3 Mt grading approximately 11% Zn Eq. over an average width of 8 meters to a vertical depth of approximately 1,500m. Exploration efforts have reportedly been unable to extend the life of mine. The existence and abundance of zinc, gold and silver indicates that the hole may have intersected the edge of the VMS system. The high-grade nature and strong continuity of gold and silver, with assays including 2.4 g/t Au and 74 g/t Ag over 4.2m suggests that the system is long-lived and robust (See Table 1). In addition, the geophysical interpretation also supports the geological interpretation, showing the majority of the target is at depth (See Figure 4). The Company’s geophysical target is modeled to have similar conductance as the intersected zone and extends for approximately 700m along strike and 1,050m in vertical extent, almost entirely below the hole (See Figure 4). The intersected zone consists primarily of lower conductivity or non-conductive metals including zinc, gold and silver. Several historic deposits at the Pine Bay Project, along with the Centennial Mine to the south, are poor geophysical conductors. 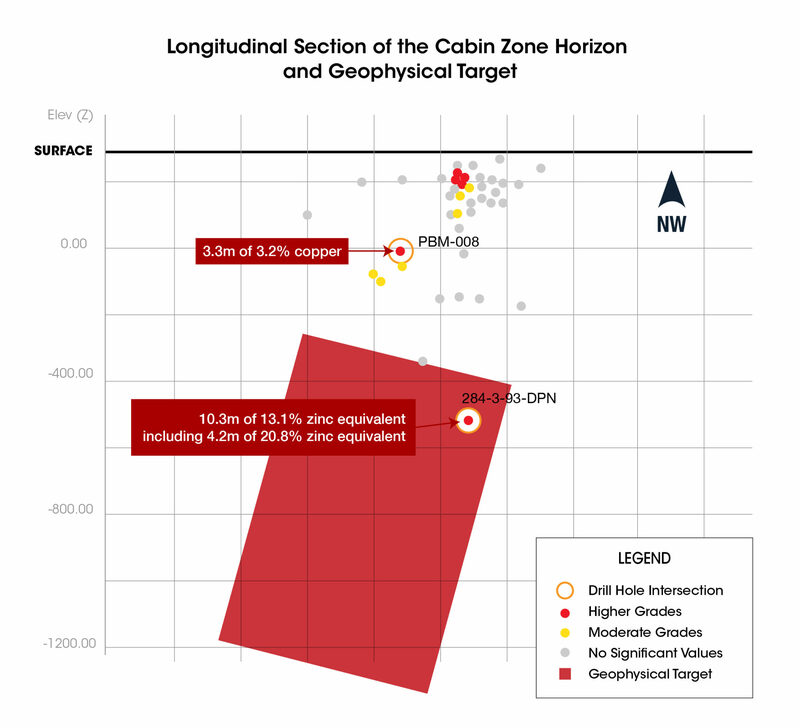 After reviewing drilling results from earlier this year, Callinex theorized that the Cabin Zone Horizon may not have actually been intersected at depth by historic drilling. Several previously drilled holes including 284-3-93 and 95-02 were selected for deepening as part of the ongoing drilling campaign. Placer Dome had interpreted that the Cabin Zone Horizon was intersected at a down-hole depth of 923m, approximately 77m before where we now know the horizon is located (See Figure 1 and 2). Despite Placer Dome’s incorrect interpretation that the down-plunge portion of the Cabin Zone Horizon had been tested, they continued to recommend additional drilling to the south where they believed that the most prospective area remained. This target area is coincident with the newly detected, large (700m wide by 1,050m deep) borehole geophysical target identified from hole 284-3-93-DPN that intersected the newly discovered mineralization. Placer Dome’s final hole, 284-5-93 was drilled to test this area but was abandoned due to drilling difficulties and represents an upcoming drill target. This discovery hole is located within the Baker Patton Felsic Complex, one of the largest and most highly altered accumulations of felsic rocks within the Flin Flon Greenstone Belt. A major alteration zone had previously been identified at surface and spans 1,100m by 700m as defined by values of more than 90 using the Hashimoto (Ishikawa et al.) Alteration Index (See Figure 2), a quantitative approach to evaluate alteration trends that ranges from 0 to 100. Since the huge alteration zone seen at surface is structurally overturned, the exploration thesis is that the massive sulphides associated with this mineralizing event would be preserved at depth. Typically, there is a correlation between the size of an alteration zone and the size of VMS deposit it is associated with. The exploration model for large VMS deposits within the Flin Flon Greenstone Belt, such as the Lalor and 777 deposits, includes having several smaller deposits in close proximity to a large alteration system within a major felsic volcanic centre. 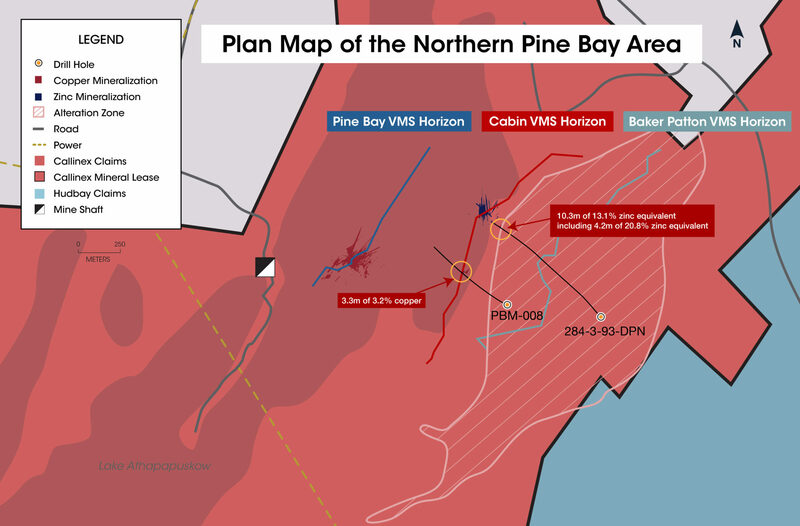 Historic and recent exploration has identified three VMS deposits, along with the new Pine Bay East Zone, known to exist in close proximity to the huge Baker Patton alteration zone. Inmet Mining Corporation also attempted to test the Cabin Zone Horizon with hole 95-02, which was drilled 400m along strike to the south of hole 284-3-93 but was stopped short of the horizon. 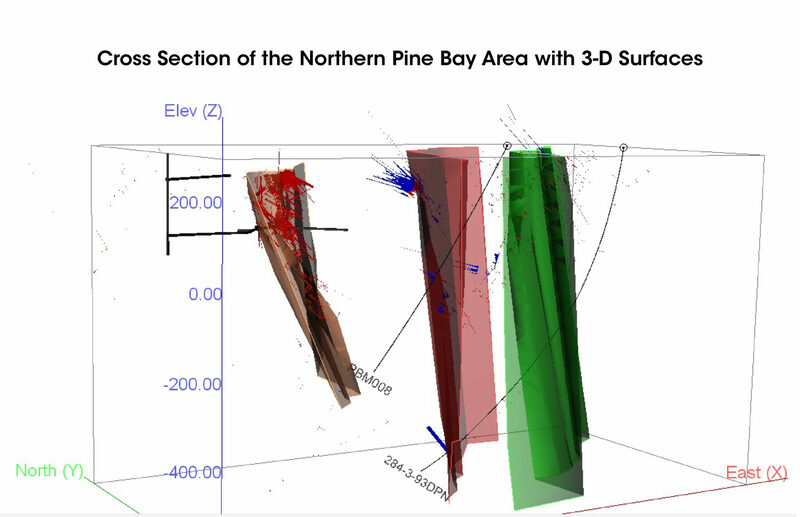 Callinex is currently deepening this hole to test the down-plunge extension of the recently discovered Pine Bay East Zone (See News Releases Dated March 7th, 2016 and May 31st, 2016). (m) Interval (m) Zn Eq. Dip and azimuth for hole 284-3-93-DPN is -85⁰ and 317⁰ The 1,101m deep diamond drill hole is located at the following Universal Transverse Mercator (UTM) coordinates using the North American Datum of 1983 (NAD83) within UTM Zone 14N: 332882m East and 6071554m North. The collar of the hole is 321m above sea level.